I’m in love… I’m in love… with the other woman. My life was fine… life was fine… until she blew my mind! There’s a new woman playing house in my home of late and I’m in love. In love with the time and effort she has saved me. In love with our stress free meal time each night. In love with the quick and easy healthy meals that have been hitting the table as a result. In love with the fact that someone else is letting off steam in the kitchen and I’m reaping the rewards. So many rewards. I must confess, the other woman is in fact my Kambrook Pressure Express Digital Multi Cooker. I should also confess, that I’ve had my new appliance for more than a little while and I love her so much that I probably should name her. I had grand plans to bring you this review and launch the giveaway late last month but well… I’ve been too busy cooking. Although, busy probably isn’t the right word here because if anything this appliance has cut my cooking time, just not necessarily my time spent in the kitchen. In a nut shell, this multi cooker has increased my production and given me back my love of being in the kitchen in the first place. Something I lost when we moved into our temporary accommodation and found ourselves back in the 1960s. A time when it would seem bench space and power points didn’t lend to more than one appliance. Playing a daily game of kitchen appliance twister saw me pack most of my appliances up and place them into storage. Then there is the original 1960’s Fahrenheit oven that almost needs a good hour to preheat. Its lack of fan force, forces me to rotate food every five minutes and even then most things come out of the oven half burnt or half baked. Not good. Ohhh… and did I mention the deep and dark cupboard that doubles as a poor excuse for a pantry? Is it any wonder my kitchen mojo took an extended holiday? Thanks to my new Multi Cooker all that has all changed. This fab appliance not only takes pride of place on the limited bench space in our kitchen, it does most of the cooking, most nights. This may be a pressure cooker but it is so much more. For the past six-ish weeks, I’ve been testing the appliance with some impressive results. Is it a pressure cooker? Is it a slow cooker? 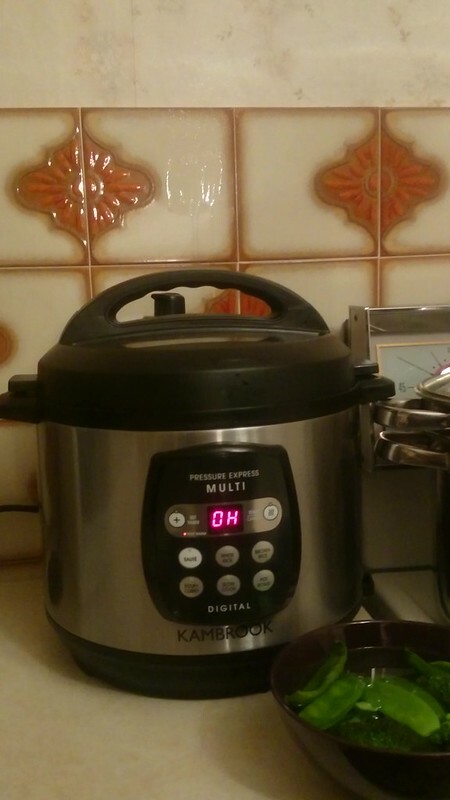 No… it’s the Kambrook Pressure Express Digital Multi Cooker. An appliance that is both pressure cooker, slow cooker, soup/curry maker, rice cooker (white and brown) and if that wasn’t enough it also sautés which means you have the ability to dish up some impressive one-pot wonders. Pressure cooking is just one element to what you can do with this appliance but for me, it’s probably the most impressive. 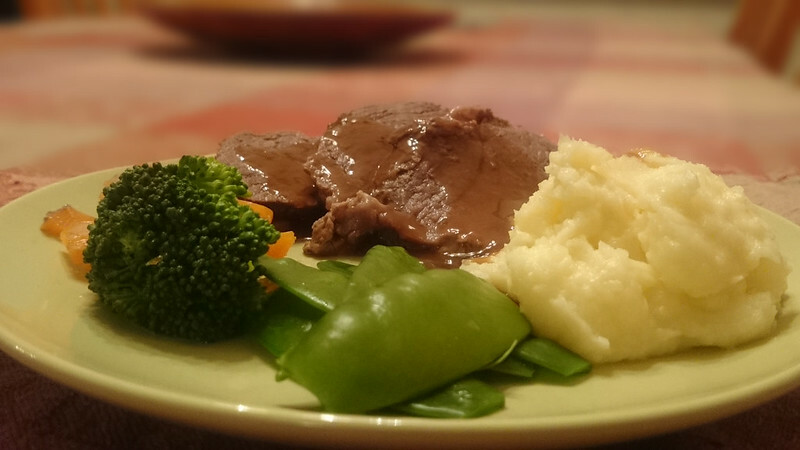 You can have a pot roast meal on the table in around 40 minutes OR LESS, with very little preparation time needed. Drool worthy risotto takes even less time. What has impressed me the most is how quick and easy it is to both use and clean. Once you get over your pressure cooker nerves that is. If you are new to pressure cooking, like me, it can be a bit nerve wracking to start with. Although I’m not sure why? Possibly the horror stories I’ve heard over the years with pressure cookers and people doing the wrong thing. Let me tell you, it’s very hard to do the wrong thing with this appliance, especially the pressure cooking side of things. I’m a huge fan of slow cooking, I just never seem organised enough in the mornings to take advantage of this side of things. Given I’ve had almost the same juicy pulled pork results using the pressure cooker compared to the slow cooking function, I honestly have only used the slow cooker function twice. There are several dishes where I’ve only needed to use the one pot with one or two functions on the appliance. It means cleaning up is also a whole lot easier when you can sauté in the same dish as you cook. It also means that a lot of meals take little preparation or fuss. Being able to set and forget, then get on with more important things for time poor me, is all kinds of wonderful. Being new to pressure cooking, I found it preferable to stick to tried and tested recipes initially. Once my confidence grew, so did my creativity. While it is important to stick to certain liquid ratios when using the pressure cooking function, that doesn’t mean you can’t have a lot of fun experimenting AND it certainly doesn’t mean a whole heap of stews and sloppy food. This is honestly my first experience with pressure cooking, so I have nothing to compare it with but even still, I’m more than impressed. At just $129.95 RRP, I think you would be hard pressed to find a better multi cooker or pressure cooker, for that matter. I’m also impressed that we can put a decent meal for a family of five on the table in less than 40 minutes, with very little effort (usually 5 minutes prep) on my part and most of the time there are enough leftovers for lunch the following day. The fact I’ve been able to use much cheaper cuts of meat and still dish up a meal the whole family will devour, has me more than sold on this appliance. Yes, you can do the same thing with your slow cooker but this doubles as a slow cooker, a rice cooker and much much more. 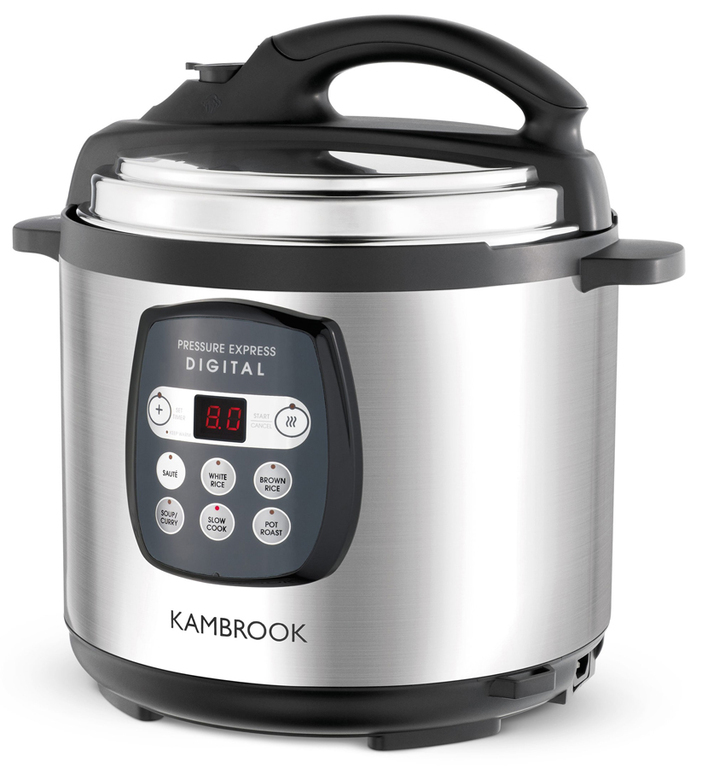 Given the lack of space in my kitchen, being able to have one device that is big enough to feed the entire family without the need to fork out a small fortune or join a cult, has me giving the Kambrook Pressure Express Digital Multi Cooker… 4.5 worth casing stars out of 5. It would need to be self-cleaning for 5 out of 5. Although, I should add cleaning this appliance is relatively easy, I’m just not a huge fan of cleaning. Who is? See… I wasn’t kidding about the lack of bench space and our 1960’s oven. • Even if you know your way around a pressure cooker, it is best to read the instruction manual before use. • It might take you a couple of takes at the same recipe to get the liquid ratio just right if you are making recipes up as you go along. Probably best to stick to tried and tested recipes in the interim (see A Perfect Pantry). • It’s important to properly clean the vent after each use but this is a quick and easy process. • Best not to leave the appliance unattended while the pressure cooker is in use. For me that was easy. Once you set and forget, I just move to the kitchen table and tackle my emails while I’m waiting. The longest I’ve had to wait was for our pressure cooked roast beef (35 minutes cooking time). • If you want photographic evidence of your cooking endeavours, for a blog post or Instagram, it might be best to throw the starving hubby and children a bone. Mine come running the minute the appliance beeps and the steam is released. They have no patience for photo taking at meal time. None. Like all my giveaways, entry is super easy. Just follow the rafflecopter prompt below and leave a comment below letting me know why you NEED to win this prize and what dish you would attempt first if you won. Too easy. Like a good GIVEAWAY? Make sure you head over and case this month’s Aussie Giveaway Linkup. There are some fab prizes up for grabs, including a mystery hamper for yourself and a friend. **I was gifted the product for review and a second product for giveaway thanks to Kambrook, one of my ongoing blog sponsors this year. As is the case with all my reviews… opinions, crazy cooking antics and torturing my family at meal time to attempt to get photographic evidence of the results… are my own. Clearly I need a better strategy with the photographic evidence. Something I will be attempting to share on Instagram throughout the month. Any tips?